Icon – Eat Me. Drink Me. This spoon was a spoon that my grandmother held. She stirred soups with it, melted butter into noodles, nudged vegetables in a pan. All that’s left of it now is the wood that’s worn smooth and what was once a cupped surface that looks as if it’s been licked too many times. The handle is polished with palms and bent, warped from the heat of a skillet. My grandmother has been gone for years. I barely remember her. Although if I close my eyes I can still hear a laugh that I think belonged to her. I have nothing of hers except my name, and that too is shared with my other grandmother. But now I have this spoon. It was probably once longer, and straighter, and more useful to use. 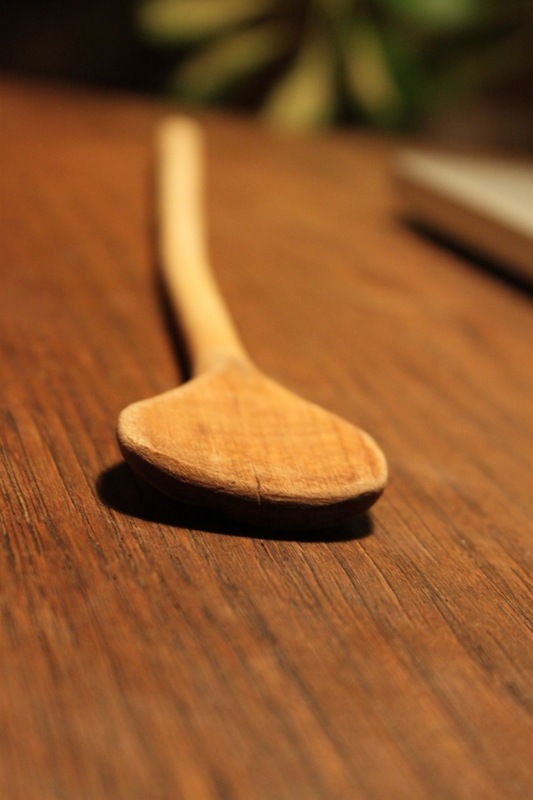 And yet, this is how a wooden spoon should be – well worn, paced, serving until it disappears piece by piece into the dishes it stirs, and these hereditary splinters connect us. This is beautiful. And so aptly describes why I love wooden cooking untensils – they carry their history around with them. And I’m much less inclined to throw it out when it gets ‘yucky’.